1. 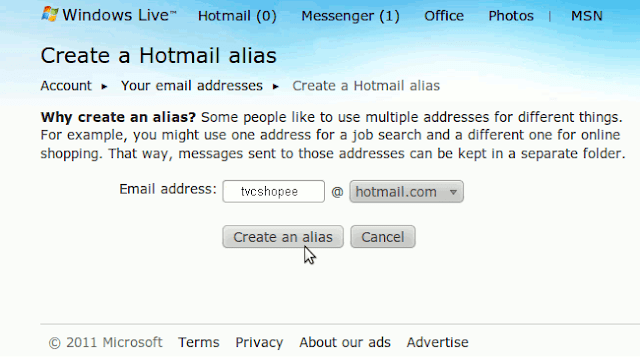 Login Hotmail, Ahead Inbox there is small star click on it and select "Create Hotmail alias"
2. You will face a screen shown below. Enter your disposal email id there which you want to create and click on create an alias. 3. In next screen, it will ask you messages for this email address where do you want to receive? either in the new folder or in the existing inbox. Select new folder. and click on done. 4. After this, you will get the confirmation email in your inbox that disposal e mail address is ready to use. 5. Now your disposal email id is ready. But keep in mind to read emails of related to that id you have to use your original, main id to log in Hotmail.